Eco-Screen Partitions are designed with the knowledge that Sustainability is Mainstream. When products and materials are made with this principle in mind, an earth-friendly idea becomes a natural choice. As a value it means clean air, water and responsible resource management. Choosing sustainable products means living, working, learning and playing in a healthier world. The design of Eco-Screen incorporates PaperStone as its core material. PaperStone is not just an attractive new material that is produced in a socially responsible manner. It is also strong, tough and extremely durable. It has steel-like strength in span, stone-like beauty in appearance and is worked like a fine hardwood. PaperStone is a heavy duty composite known for its environmental sustainability. It is made from 100% post-consumer recycled paper and proprietary PetroFree™ phenolic resin. A 1" x 5’ x 12’ panel of PaperStone versus a traditional phenolic composite manufactured from virgin fiber and a commercially available resin saves: 1,233 gallons of water, 2.03 million BTUs of energy, 131 lbs of solid waste, 254 lbs of greenhouse gases and 55 lbs of petroleum based phenol. 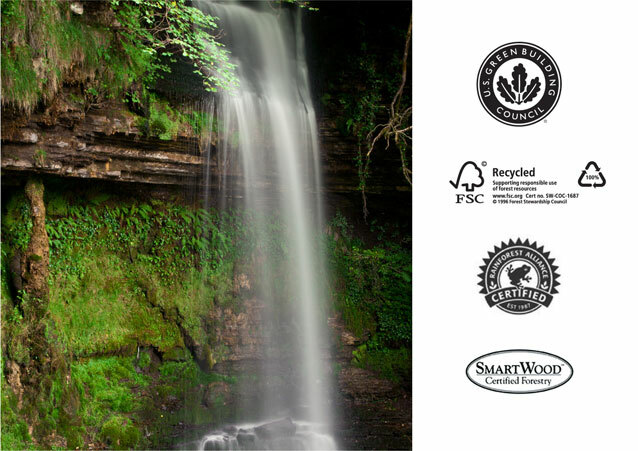 PaperStone is the only solid surface material certified by the Forest Stewardship Council, SmartWood Certified Forestry and the Rainforest Alliance. The use of Eco-Screen can assist in a commercial project obtaining LEED certification by contributing points for Recycled Content, Local Regional Material and/or Rapidly Renewable Material. LEED submittal documents are available for each Eco-Screen system manufactured. Your choice of Eco-Screen is Sustainable and Mainstream.